Iberian Chiffchaff Phylloscopus ibericus, Challacombe Farm, Devon, England, 28th May 2006 (© John Philip Lee). Courtesy of the authors and British Birds 101: 174-188 (April 2008). This paper should be read in conjunction with Svensson (2001) which provides biometric data and in-hand criteria for identification of Iberian Chiffchaff. The statement in Collinson & Melling (2008) that Iberian Chiffchaff has a shorter bill on average than Common Chiffchaff is not supported by Svensson (2001). The bill of Iberian Chiffchaff is on average slightly longer than that of Common Chiffchaff, though there is much overlap and the difference is not likely to be noticeable in the field. The range map of Iberian Chiffchaff presented as Fig. 1 in Collinson & Melling (2008) was, as stated in the figure legend, provisional. A corrected range map (shown below) was published subsequently with further information and discussion on the validity of the subspecies biscayensis (Copete 2008). Further opinion on mixed singing chiffchaffs is provided by Dubois (2008). Breeding range (abandoned in winter) of Iberian Chiffchaff Phylloscopus ibericus (modified after Copete 2008). The following sound files correspond to the sonogram figures of the PDF file. When comparing sonograms please note that x-axis (time) and y-axis (kHz) can show different ranges and scales respectively. Presumed advertising song of Skelmersdale chiffchaff, 29th April 2004. This sonogram represents a single typical example of the two-phase song of the bird. The first part of the song consists of notes that are not uncommon for Common Chiffchaff Phylloscopus collybita. The frequency range of 3-8 kHz goes outside the normal range of Iberian Chiffchaff P. ibericus. The first part of the song can be described as 'chiff chaff chaff chiff chiff chiff chiff' with 'chiffs' at 5-6 kHz, 'chaffs' at 3.5-4 kHz. The spacing between the notes (0.3 s) is slightly greater than is typical for Iberian Chiffchaffs. 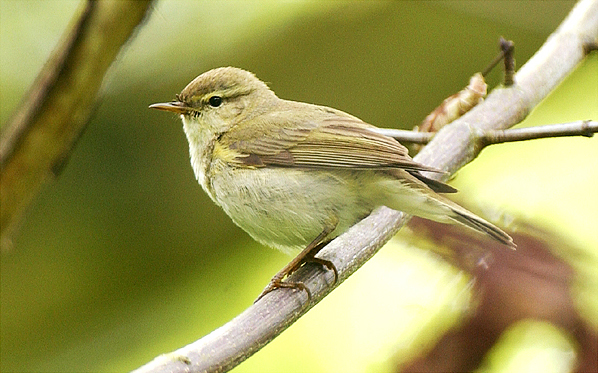 The terminal rattle is a faster series of standard Common Chiffchaff 'chaffs' at 4 kHz. This is the 'reverse tick' song element that can be produced by either species. There are no diagnostic Iberian 'wheep' elements. 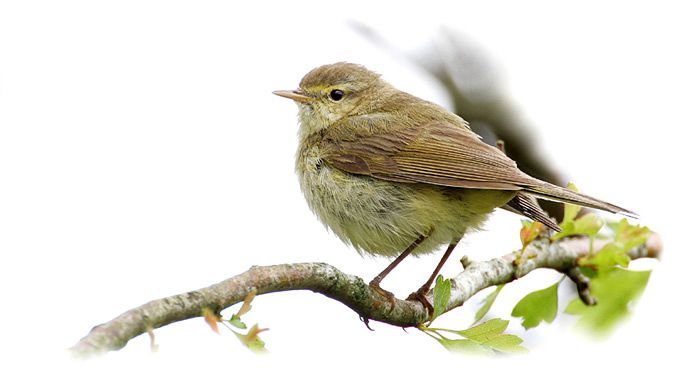 The total length of the song and, in particular, the terminal rattle, is atypically long for Iberian Chiffchaff. Dibbinsdale chiffchaff Phylloscopus collybita, England, May 2004 (© Steve Young, www.birdsonfilm.com). A mixed early section of low-intensity song composed of 'djips' and rattles with ibericus-type 'djip's at 3-7 (weakly 8) kHz then an Iberian-type rattle at 3-5.5 kHz, e.g. 'djp djp djp djp ch-ch-ch-ch-ch-ch'. After the Iberian Chiffchaff song was played back to the bird, it commenced a Common Chiffchaff type song that may represent the normal 'conflict' song of Iberian Chiffchaff in response to a rival, but note that the frequency range is high - up to 8 kHz,'chiff chaff chiff chaff chaff chaff chaff'. It subsequently returned to normal (higher intensity) Iberian Chiffchaff advertising song incorporating diagnostic 'wheep's:'djp djp djp djp ch-ch-chch-ch wheep wheep'. The bird also gave one burst of mixed song transcribed as [Common] 'chiff chaff chaff' [Iberian] 'wheep wheep wheep wheep'. The first three notes of the mixed song at frequency 3-8 kHz are of a Common Chiffchaff type. Typical advertising song, from 24th April 2007:'djip djip chu wi-wi-wi-wi djp djip chu-i djp djip djip chu wi-wi-wi djp djip chu-i'. A mix of collybita and ibericus elements, elements that could belong to either species, and elements that are atypical for either, and more reminiscent of some song elements produced by 'Siberian Chiffchaff' P. c. tristis or even Mountain Chiffchaff P. sindianus. 18th June 2007. The song is largely composed of Common Chiffchaff elements but includes some clipped 'djip's at 4.5-5.0 s and 6.5-7.0 s that are more associated with Iberian Chiffchaff. Although the first two elements are suspiciously high frequency and more characteristic of Common Chiffchaff, this is essentially an Iberian Chiffchaff song:'djip djip chp whee wi-wi-wi-wi'. July song, preceded by upwardly inflected 'huit' call typical of Common Chiffchaff and which precludes identification as Iberian Chiffchaff. The song is essentially that of an aberrant Common Chiffchaff that contains elements which may be characteristic of Iberian Chiffchaff but which equally may represent degraded versions of elements of the songs of other species. Colney, Norfolk, April-May 2007. This song is typical of Iberian Chiffchaff, and contains no song elements that would be normal for Common Chiffchaff; the short, four-phase, 2.5-s song remains below 6.5 kHz and can be transcribed 'djp djp djp djp whee whee djip cha cha cha cha cha'. The descending call is represented in the sonogram below in comparison to the call of the Iberian Chiffchaff at Great Tew, Oxfordshire, England, 27th April to 15th May 2000 which was accepted by BBRC (see Fig. 3c). We also have recordings in which the same bird produces less classic, more erratic, Common Chiffchaff-like songs, which probably deserve further analysis. Beer, Devon, May 2007. A less distinctive song, though consistent with that of Iberian Chiffchaff. This sonogram is educational because there is a Common Chiffchaff singing in the background. Note the difference in shape and frequency range between the Iberian Chiffchaff (red) and Common Chiffchaffs (blue): 'djp djp djp djp djp djp wheep wheep'. We thank Andreas Noeske for preparing new sonograms, the online map and promoting this online presentation, L.A. Batten, Gavin Haig, Andrew Harrop, Peter Hobbs, Will Soar for providing their sound recordings, John Philip Lee and Steve Young for their excellent photos. Copete, J. L. 2008: Distribution and identification of Iberian Chiffchaff. Brit. Birds 101: 378-379. Dubois, P. 2008: Mixed-singing Iberian Chiffchaffs: is it their 'swan song'? Brit Birds 101: 379-380. Svensson, L. 2001: The correct name of the Iberian Chiffchaff Phylloscopus ibericus Ticehurst 1937, its identification, and new evidence on its winter grounds. Bull. B.O.C. 121: 281-296. Hudson, N. & BBRC 2008: Report on Rare Birds in Great Britain. Brit. Birds 101: 516-577.